Heat oven to 375°F. Lightly spray cookie sheet with cooking spray. Unroll dough onto cookie sheet. Spread dressing over dough to within 1 inch of edges. Layer half each of the salami and cheese lengthwise in 5-inch-wide strip down center of dough to within 1 inch of each short side, overlapping salami and cheese. Repeat layering with remaining salami and cheese. Fold long sides of dough over filling; pinch edges in center to seal. Fold ends under 1 inch; seal. Cut several slits in top for steam to escape. Bake 20 to 24 minutes or until deep golden brown. Cut crosswise into slices to serve. 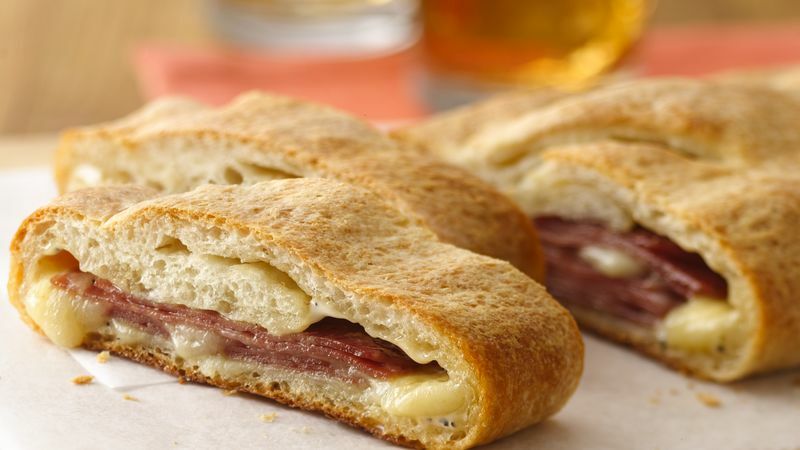 Choose your favorite meat and cheese for a variation on this stromboli: substitute pepperoni or pastrami for the salami; try mozzarella or Muenster cheese instead of the provolone.